Description of "Breaking Free of Nehru"
Breaking Free of Nehru: Let’s Unleash India! Well meaning Nehru set out to create socialism. But inevitably we got statism, which robbed us of some of the freedom we had won in 1947. Its License Raj damaged our moral character and made us one of the most corrupt societies on the earth. It shattered accountability so completely that even today the Indian state is unable to deliver minimal services to its citizens. As a result above-average people produce below-average results in our government. In this book, Sabhlok writes energetically and with great hope for India’s future. He has a vision of a new India and wants to share that with us. He begins by asking, why India wanted independence in the first place namely, to achieve individual freedom. Then he asks whether India is truly free today. He goes on analys the factors that are constricting India’s freedom and finally delves deep to find the reasons behind the rampant corruption and blatant inefficiency in Indian governments. Nehruvian socialism becomes his prime suspect. knowledge and experience that includes working for 25 years in governments in India and Australia. Sanjeev Sabhlok entered the Indian Administrative Service in 1982 and resigned 18 years later, as a Commissioner and Secretary to the Meghalaya Government. He received a doctorate in Economics from USA in 1999 and has worked since 2001 in the Australian public sector in regulatory policy and enforcement. 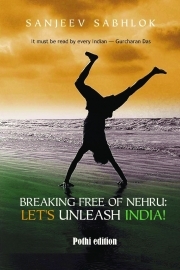 Reviews of "Breaking Free of Nehru"